I’d like to wish everyone a happy new year. I am excited about 2007 for a bunch of reasons. In my business endeavors I am particularly excited about the developments happening in our Union Square Ventures portfolio. We’ve been investing for a couple years and we now have a portfolio of companies, not ideas or projects. All but one of our companies are generating revenue. A couple will be profitable this year. And one, Bug Labs, will come out of "stealth mode" and show everyone what they have been up to for the past year. I am excited. I am also excited to watch the companies left in the Flatiron portfolio continue to build what have become large and profitable businesses. Venture capital done well has a long time horizon. We get involved when its not much more than an idea. And in the best companies, we stick around for a long time. I love that. I am less excited about what Todd Dagres called "a bubble in company formation" happening in the web space. As Todd pointed out in the WSJ debate with David Hornik, the barriers are so low to starting a web company that everyone is doing it. I heard from my oldest daughter that one of her friends who is a senior in high school may not be going to college because he’s got his web businesses to run. That may be the right decision for him, but it points out just how far reaching this web entrepreneur thing has become. On the other hand, 2007 is going to be the "show me" year for many of the web investments made in 2005 and 2006. And I think some companies are going to come up fairly empty on their initial business plans. That should help to keep everyone focused on the reality that not every good idea turns into a good business and hopefully it will bring some rationality to what is clearly an overheated market right now. But I don’t want to focus too much on the negatives. 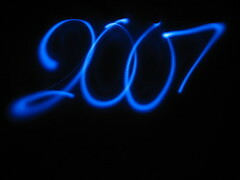 There are a lot of exciting new things happening, some of which I pointed to in my "2007:" posts. I hope you were able to read them. I am really looking forward to 2007. I hope you are too.